DURING WORLD WAR I, superheatedsteam kilns were used in the Pacific Northwest and very rapid drying rates were reported. 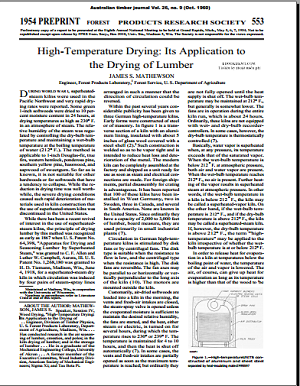 Some green 1-inch softwoods were dried to 10 percent moisture content in 24 hours, at drying temperatures as high as 230° F.
southern yellow pine, basswood, and sapwood of sweetgum. caused such rapid deterioration of materials used in kiln construction that the use of superheated-steam kilns was discontinued in the United States.